Blessing of Might: Winter fashons - Savage Saronite anyone? People hitting arena in a few days will want to pick up the latest gear. Everyone will be starting out on equal footing for the first time since Season 1.... And what will the well dressed palading be wearing? Savage Saronite of course!... Or will they? This blue set of craftable PvP gear (yes but it at the AH - Between 50-90g per piece on my server) is the new "starter" PvP set for Melee classes. Other classes have similar gear but optimized for their needs. 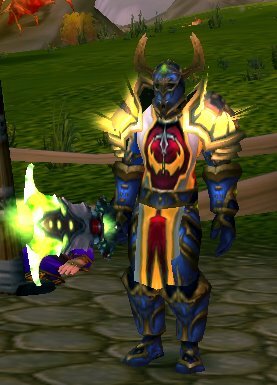 Since this blog is focused on Ret Pally's I'll just be focusing on this set.... Warriors and DK will be sharing the same gear FYI. First a quick word about stats.... at level 80 you seem to need more points for each percent difference in stats. For example at level 70 you only needed 15.8 points per 1% of hit rating. At level 80 you need a whoping 32.8 per 1%... that means that while you only needed 79 points to reach the 5% hit cap at level 70.. at level 80 you'll need 164 to keep that same 5% cap. Quite a trade off... Sure extra 1.5k health is great but it's coming at the expense of 3k less mana AND more troubling minus 51 off the hit rating. PvP hit rating was never good to begin with, in fact if I loose my current hit rating of 96 down to 45 I go down to about 1.5% hit rating. The added Resilience and Armor is nice but remember with new stats, 129 resilience is roughly an extra 1.5% not an extra 3.5% if you were level 70. SO.. with that in mind should we even bother with the blue crafted set? I'd actually like to hear some thoughts on this. Before writing the article I figures sure it's a higher level set go for it, but after running the numbers I'm thinking of holding off for the actual Arena gear. The bonus to CS from the gloves is hard to let go of. I wouldn't worry too much about being at the level 80 equivalent of 400-ish resilience since everyone is going to be dealing with the degrading of rating values. 22.1 crit rating doesn't get you 1% crit anymore just as Hit and other things have changed. People are either going to be defense-stat heavy, offense-stat heavy or some mid-range. You aren't going to be seeing any MS warrior with 25% crit damage reduction and 40% crit rate anytime soon. Yeah that makes a lot of sense. Thanks for the comment. TBH, im thinking of giving arena a try as a prot warrior. I have great mitigation, alot of interrupts, and my damage isnt piddly anymore. Stack that with an offensive powerhouse (my ret pally buddy), and I think we have a winner!! Last season you would have been laughed at... but it's a whole new game, give it a shot. I think what will happen is that in 2v2 your damage won't be very good due to a lack of buffs and you will be ignored while people go for the Ret Pally. Expect to get some CC and tell the Pally to keep his eye on his health bar. when i hit 80 i plan on starting with this as i climb up the pvp ladder. its not a bad starting point.